Cortijo El Potro is a spacious two-floor Andalusian villa set in absolute natural tranquility. It is located within very green and beautiful subtropical grounds, surrounded by nature in an authentic Mediterranean setting. The whole property of 3.300sqm is organic-certificated. The garden contains various orange, avocado and centenarian olive trees and many other Mediterranean fruit trees. You can even pick our delicious lemons and oranges and make your own fresh juice, from November to June. The shared saline-swimming pool produces a natural alternative to chlorine; it is 9 x 4m and incorporates a shallow toddler section. The pool is situated within a lawned garden and is surrounded by a child-safety wooden fence. These precautions will certainly guarantee a restful, fun and relaxing holiday for the whole family. The lush garden has a playground with a slide tower, tire swing, rocking horse and badminton net. The property is only 1km away from Orgiva (10-15 minutes walking distance) but it offers all the quietness and tranquility of pure nature to make your holiday as pleasant and restful as possible. Cortijo El Potro is characterised by a large kitchen and dining area, a wide living room with an open fireplace and two bright en-suite bedrooms. The master bedroom has direct access to a large beautiful sunny terrace which overlooks the garden and has fantastic views of the valley and the mountains. The villa offers free WIFI, international and internet TV, with an online video library similar to Netflix. It has heating/air condition, an oven, a dishwasher and an open fire place. The house contains all you need, for example: sharp kitchen knives, large red wine glasses, quality mattresses and bed linens, north European standard duvets, all types of towels, relax-loungers and plenty of firewood. Everything is tastefully decorated, comfortably furnished and equipped to a high standard. There is another house within the grounds (50m away), which is divided into three parts; our home and two self-contained holiday apartments. Each house has its own garden area and barbecue and is peacefully secluded by lush vegetation. The pool area is shared by all houses within the grounds. It is only 30 minutes to the beaches of the Costa Tropical. 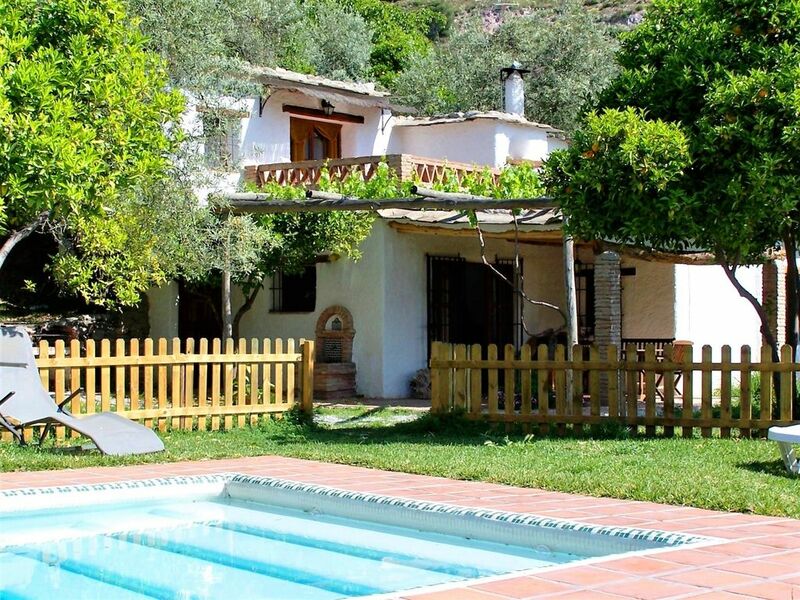 Cortijo el Potro is placed in a green and lush garden, surrounded by wild nature. It is a very calm and peaceful place. In the house are not, as often common in southern Europe, loose sheets with loose Acrylic blankets on top, but depending on the season thinner or thicker quilts with an appropriate bed coating. There is free wifi in the house, on the terraces and in the garden, including international internet-TV with free video library. We provide Spanish digital-TV in Spanish and original audio, international satellite-TV and international Internet-TV with sport and cartoon channels and a free Videothek of 1.000 titles and series. The upper sun terrace offers a panoramic view all over the village, the valley and the mountains. In winter, you can savour a relaxing sun bath, while enjoying the beauty of snow-capped peaks. he pool and the pool area in the centre of the property is shared by the three holiday houses on the land. It is child safely fenced and works with a skin compatible Salt electrolysis system. The pool and the pool area in the centre of the property is shared by the three holiday houses on the land. It is child safely fenced and works with a skin compatible Salt electrolysis system. The property is awesome, very clean, anything you need to spend a relaxing vacation in Orgiva. We spent a wonderful week staying at Oliver's cortijo. In the lead up to the holiday, Oliver was communicative and helpful, and we arrived to a spotless, spacious and well-equipped and laid-out cottage. We went with our two daughters, and the cottage and property was perfect - much of the days were spent at the pool, and there was a swing which our eldest loved. We bbq'ed just about every night. The house is well located - being out of Orgivia means it feels exceptionally quiet and peaceful, but the town is literally a five minute drive away, so getting groceries etc is no sweat. Orgivia is an okay town - we much preferred exploring the villages further afield. During our time, we spent a wonderful day in Granada (an easy drive of just over an hour) and also did some hikes. Overall, it was a perfect holiday, and we would absolutely recommend staying here. We came here mid-January for 4 weeks to escape the British winter and do some walking. We had a super time - especially as it didn't rain in Orgiva at all! In fact, the weather was bright and mainly sunny. Everything exceeded our expectations, the weather, the scenery, the overall comfort of the cottage and the friendliness of the owner, Oliver, and family. We found the cortijo comfortable, we slept well and the views were amazing (every day, even after a month). The photos don't do the scenery justice. The light and airy downstairs windows make the cortijo feel spacious and there is plenty of outside space (grass area, downstairs shady patio and upstairs sunny terrace and the pool area). It was a delight to pick oranges to drink juice on the terrace looking out at the mountains. The kitchen is equipped with a microwave, electric oven, gas hob and dishwasher and the lounge TV has satellite channels with sport and films. The owner's discrete yet effective support was most welcome. His speed of response was always impressive. In particular he recommended a (mid-Feb) really good drive route for the Contraviesa almond blossom (beautiful). With help from the family we joined a local walking group and were recommended several walks. Overall having the owner discreetly nearby helped to make the holiday more enjoyable. Meteoblue is a good place to get weather info. We found other forecasts misleadingly showing the (much colder) weather forecast for Granada when you look for Orgiva weather. Would we go back there for another winter holiday? Yes, definitely. Many thanks for your really detailed and comprehensive review. We can't say enough about how happy we are when our guests spent a really lovely and relaxing holiday in our property and how good it feels for us when we can see that they could recognize and enjoy this amazing beauty and peculiarity of the Alpujarras area. It's always our pleasure to offer all kind of suggestions, advices and ideas to explore Andalucía deeply and extensively and dive into its culture, leisure offers and beauty. We can see that you have enjoyed the house and the gardens greatly and have taken care of it with the same affection that we do. comments and hope to welcome you soon again in the future. Cortijo El Potro is settled in a wide and green terraced land of 3.300sqm with lush garden, surrounded by pure and calm nature and the impressive wild landscapes of Sierra Nevada but just 1km away above the town Órgiva.